The word regression in its original Latin of regressionem refers to a process of going back to an earlier state, and for Regression Therapy this means going to the source of a psychological problem. 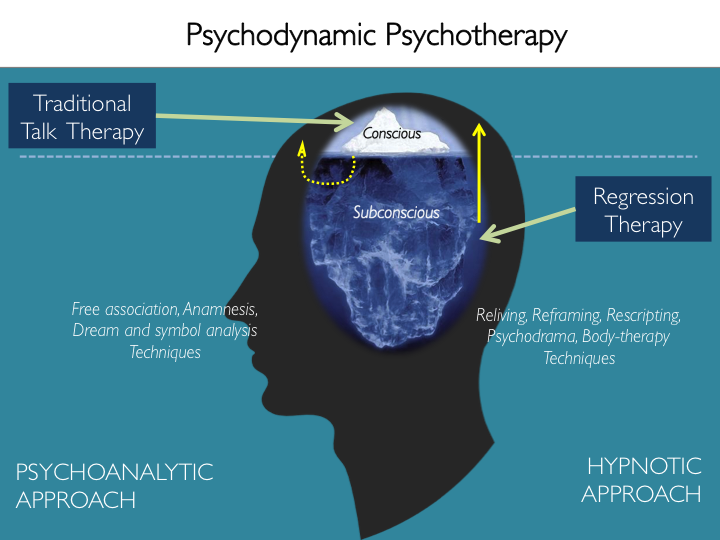 It uses a range of hypnotherapy and psychotherapy techniques but differs by putting more focus on regression and working with transpersonal experiences to transform them. When the memories involve one’s early childhood a term often used is age regression, (Banyan 2001)1, hypnotic regression (Hunter, 2012)2 or regression hypnotherapy (Churchill 2002)3. When past life stories appear it has been referred to as past life regression. However, regression therapy does not try and prove the truth of these stories and uses the rich metaphorical interpretation by the client to provide a powerful transpersonal experience for healing. When the source of the problem comes from traumatic memories regression therapy includes body memory transformation. Medical professionals, psychiatrists, psychologists and other regression therapists work to a single international standard set by the Earth Association of Regression Therapy (Mack 2014)4. "Among psychotherapists, regression is regarded as a valuable psychiatric technique by many reputable practitioners”. (Independent, UK - 14 March 2015)5. Sigmund Freud introduced the idea of bringing the unconscious mind to conscious awareness for healing and has been regarded as the grandfather of modern Regression Therapy. (Lucas, 2007)6. Carl Jung’s use of active imagination has also influenced the development of guided imagery techniques used in Regression Therapy (Mack 2015)7. In the 1950’s a British psychiatrist Alexander Cannon regressed over 1400 patients with symptoms that were not curable by conventional means and observed significant improvement. (Casimiri, 2013)8 By the late 1960’s and 70’s the use of hypnotic age regression had become generally accepted by the medical profession. (Barber 1962)9. Using an affect bridge it enables a person to connect quickly with a relevant past memory by using an emotion. This gave momentum to the initial development of Regression Therapy (Baldwin 1994)10. In the 1960’s a British psychiatrist Denys Kelsey working with regression concluded that the origin of some psychiatric problems may reside in past lives. (Grant & Kelsey, 1967)11. In the 1970s four books on past life regression were published: Deep Healing by psychologist Hans Ten Dam, Reliving Past Lives by clinical psychologist Helen Wambach, You Have Been Here Before by psychologist Edith Fiore; Past Lives Therapy by Morris Netherton. These books had in common a therapeutic use of past life stories. (Mack 2015)12. In the 1980’s Roger Woolger taught the value of working with the body and pioneered the regression technique of combining body psychotherapy with psychodrama to release the traumatic memories embedded in particular body memories. (Woolger, 1988)13. In the early 2010’s Dr Peter Mack a practicing surgeon from Singapore and regression therapist wrote two books about his patient’s healing stories – Healing Deep Hurt Within (Mack 2011)14 and Life Changing Moments in Inner Healing (Mack 2012)15. Shortly afterwards an international meeting of psychiatrists, medical doctors and clinical psychologists using regression therapy took place in 2013. From this the Society for Medical Advance and Research in Regression Therapy was formed. (Mack 2014)16. The Society published its first book Inner Healing Journey – A Medical Perspective in which six medical doctors including two psychiatrists shared eleven client healing stories using Regression Therapy. (IHJ back cover)17. Based on classical science and the influence of Rene Descartes the conventional medical model sees illness as a random event, and the cause of disease and its cure as coming from outside the human body. In contrast the holistic health model in regression therapy sees illness and healing as coming from within the individual. (IHJ p 248)22 It is based on the principle that the patient’s body reflects the deeper struggles of their entire life. Hence, illness is deemed not to occur randomly, but when emotional, psychological or spiritual stresses have overwhelmed or weakened the body defenses. The therapeutic objective is to assist the person to regain a healthy balance. (Mack, 2014, p248)22. Unlike the medical model the patient helps interactively during the Regression Therapy process (Simoes, 2002)23 . Age regression is a technique used in hypnotherapy and involves going to the suppressed emotion of a life event that is thought to be causing a patient’s problem. This can involve early childhood memories and enables the person to release suppressed emotions in a safe environment and is a powerful healing mechanism used in Regression Therapy (Maier-Henle, 2004)28. Psychologist John Bowlby established how early childhood memories can cause dysfunctional behaviours in later life. (Bowlby, J (1951)29. John Bradshaw introduced the use of concept of inner child for unresolved childhood experiences and psychatrist Soumya Rao has described how this can be successfully incorporate into the Regression Therapy process (Rao, 2014)30. Bessel van der Kolk the director of the Trauma Centre at Boston University says. “When the physical sensations of trauma produce intense emotions the therapy needs to consist of helping people stay in there bodies and understand the body sensations.” (Van der Kolk 1994)31. The body always carries the memory of past events and can provide an important bridge in regression therapy. (Tomlinson 2005)32 More recently, psychiatrist Moacir Oliveira has shown how body therapy in combination with regression therapy can be used to resolve traumatic memories. (Oliveira, 2014)26. A wide range of emotional problems have been resolved with regression therapy. Psychologists and medical doctors have resolved anxiety (Mack 2012)33 anger (Mack, 2012)34depression (Mack, 2011)35 self-harming (Tomlinson, 2005)36 post-traumatic stress (Tomlinson 2005)37 phobias (Mack, 2012)38 low self-esteem (Maier-Henle, 2014)28. Research has shown it reduces ticks in Tourette Syndrome (Van Meason 1998)39 and psychiatrists and medical doctors have found it resolves blackouts (Mack, 2011)40. insomnia (Mack, 2011)41 migraine and unexplainable pain (Oliveira 2014)42 (Mack 2012)43 asthma (Oliveira, 2014)26, and autoimmune disorder (Sharma, 2014)44. Hazel Denning analysed the results of eight therapists with over a thousand patients between 1985 and 1992. Many of them sought Regression Therapy after they had fruitlessly tried other therapies. It was found that after 5 years 24% reported that their symptoms were completely gone, 23% reported significant improvement, 17% reported noticeable improve and 36% reported no improvement (Denning, 1987)45. Ronald van der Maesen conducted several research programs in 1994 that investigated the results of Regression Therapy with 401 patients of 32 therapists. Six months after the end of his therapy, 50% reported that their problems had completely been solved, 30% showed some improvement and 20 percent experienced no benefit. These results were reached on average with 15 hours of therapy conducted during a total of six sessions (TenDam, 1989)46. Regression Therapy may not produce the desired results if clients have difficulty entering a sufficient trance state, or if the patient is unwilling to be regressed to a major trauma (Mack, 2014)47. Some of them may be unprepared to take ownership of their own healing or unwilling to give up the symptoms because of secondary gains (Mack, 2014)47. It is not an appropriate therapy when a person is not able to think clearly and rationally or is delusional with more serious mental health problems (Tomlinson, 2005)48. Critics have suggested the techniques of regression can produce false memories because of the suggestibility of memory. This may lead to legal cases such as childhood sexual abuse. (Mullens & Fergusson, 1999)49 Regression therapists take the position that professional training teaches regression therapists to ask questions rather than give new memory suggestions (Tomlinson, 2005)50. Skeptics insist that past life memories come from a patient trying to please the therapist or cryptomnesia based on long forgotten information (Lawton, 2008.)51. Regression therapists point out past life stories do not need not be factual for healing to occur. They act like a metaphor carrying a symbolic meaning. (Lee & Mack, 2015)52. Some therapists argue that reframing a memory numbs a person to past events, hides the truth and becomes an obstacle to therapy (Armentrout, 1999)53. Regression therapists would suggest reframing only takes place after emotions are released from a traumatic memory and allows the person to discover a new ways acting from the higher consciousness insights (Lucas 1992)54. Regression therapy is practiced around the world and approximately every three years a convention is held to share techniques, research and new developments. The First World Congress was held in the Netherlands in 2003, the second in Germany in 2006, the third in Brazil in 2009, the fourth in Turkey in 2011 and the fifth in Portugal in 2015. (http://www.regressioncongress.org/previous_congresses)55. With the increasing need to advance the discipline within Medicine, the Society for Medical Advance and Research in Regression Therapy was formed in 2013 in Portugal. This is an international group doing regression therapy research led by medical doctors who share the vision to bring about the integration of complimentary and holistic approaches into medicine. (http://www.smar-rt.com/index.htm)57. 1. Banyan, C.D., Klein, G.F. Hypnosis and Hypnotherapy: Basic to Advanced Techniques and Procedures for the Professional. Abbot Publishing House, Inc. St. Paul, Minnesota, 2001, pp 107-108. 2. Hunter, C.R., Bruce, N.E. The Art of Hypnotic Regression Therapy: A Clinical Guide. Crown House Publishing Ltd, 2012, p 3. 3. Churchill, R. Regression Hypnotherapy: Transcripts of Transformation Volume 1, Transforming Press, 2002, pp 19-24. 4. Mack, P. Regression Therapy Associations. In: Inner Healing Journey: A Medical Perspective. From the Heart Press, 2014, p 265. 5. Independent, UK - 14 March 2015. 6. Lucas, W.B. Lucas, W. B. (2007). History of Regression Therapy. In W. B. Lucas, Regression Therapy: A Handbook for Professionals. Vol 1: Past-Life Therapy (pp. 3 - 22). BookSolid Press. 7. Mack, P. Imagination, Imagery and Healing. In: N. Lee, & Mack, P. Mirrors of the Mind: Metaphoric narratives in healing . From the Heart Press. 2015, pp 187-196. 8. Casimiri, D. Christians Remember Your Past Lives Learn How. Authorhouse, 2013. 9. Barber, T. X. Hypnotic Age Regression: A critical review. Psychosomatic Medicine, Vol XXIV No. 3, 1962, 286 - 299. 10. Baldwin, W.J., Sharing Space: Birth Regression for Dental Phobia. Pre- and Peri-natal Psychology journal, Vol 9, No.1, Fall 1994. 11. Grant, J., & Kelsey, D. Many Lifetimes. Ariel Pr. 1967. 12. Mack, P. Overview of Regression Therapy. In: Inner Healing Journey, From the Heart Press, UK. 2014, p 241. 13. Woolger, R. Other Lives, Other Selves: A Jungian Psychotherapist Discovers Past Lives. Bantam. 1988. 16. Mack, P. Inner Healing Journey. From the Heart Press, UK, 2014, Preface p 5. 18. Mack, P. Overview of Regression Therapy. In: Inner Healing Journey. From the Heart Press, UK. 2014, p 236. 19. Woolger, R. (1992). Chapter XIII. In W. B. Lucas, Regression Therapy: A handbook for professionals. Vol I: Past-life therapy. Book Solid Press.1992, pp. 216 - 248. 21. Mack P. Life-Changing Moments in Inner Healing. From the Heart Press, UK. 2012, p 191-192. 24. Mack P. Healing and Past Life Therapy. In: Life-Changing Moments in Inner Healing, From the Heart Press, UK, 2012, pp 171-177. 26. Oliveira M. Body Therapy for Refractory Asthma. In: Inner Healing Journey. From the Heart Press. UK. 2014, pp 163-180. 27. Adler L. If You Can Imagine It, You Can Achieve it; If You Can Dream It, You Can Become It. The Journal of Regression Therapy, Vol XIII. No. 1. 1999, pp 82-83. 28. Maier-Henle K. Self-love and Self-destruction. In: Inner Healing Journey, From the Heart Press, 2014, pp 109-142. 29. Bowlby, J Maternal Care and Mental Health, Monograph of World Health Organisation WHO. 1951. 30. Rao S. Inner Child Healing in Strained Relationships. In: Inner Healing Journey. From the Heart Press, 2014, pp 83-84. 31. Van der Kolk, B. The Body Keeps the Score . Harvard Review of Psychiatry 1994 1(5), 253-265. 32. Tomlinson A. Physical Bridge. In: Healing the Eternal Soul. O Books, 2005, p 49. 33. Mack P. Fear of Success. In: Life-Changing Moments in Inner Healing. Chapter 12, From the Heart Press. 2012 pp 121-137. 34. Mack P. Rage, In: Life-Changing Moments in Inner Healing, Chapter 9,. From the Heart Press, pp 93-103. 35. Mack P. Healing Deep Hurt Within, From the Heart Press, 2011, p 191. 36. Tomlinson A. Dissociation and Fragmentation with Deep Trauma. In: Healing the Eternal Soul. O Books, 2005, pp 167-170. 37. Tomlinson A. Transforming Current Life Body Memories. Healing the Eternal Soul. O Books, 2005, pp161-165. 38. Mack P. Snake Horror. In: Life-Changing Moments in Inner Healing. From the Heart Press. 2012, pp 153-169. 39. Van der Maesen, R. (1998) in The Journal of Regression Therapy, Volume XII (1), Past Life Therapy for Giles De La Tourettes's Syndrome, International Association for Regression Research and Therapies. 40. Mack P. Healing Deep Hurt Within. From the Heart Press. 2011, p 193. 41. Mack P. Healing Deep Hurt Within. From the Heart Press. 2011, pp 153-155. 43. Mack P. Somaticized Pain. In: Life-Changing Moments in Inner Healing. 2012, pp 139-153. 44. Sharma N. Metaphor for Autoimmune Disorder. In: Inner Healing Journey. From the Heart Press. 2014, pp199-214. 45. Denning H. Restoration of Health through Hypnosis. Journal of Regression Therapy, 1987, Vol 3, No 1, p 524. 46. TenDam H. Deep Healing and Transformation. Tasso Uitgeverij, 1989, p 39. 47. Mack P. Overview of Regression Therapy. In: Inner Healing Journey. From the Heart Press, 2014, pp 229-259. 48. Tomlinson A. Healing the Eternal Soul. O Books, 2005, p 206. 50. Tomlinson A. Healing the Eternal Soul. O Books 2005, p 209. 52. Lee N., Mack P., Mirrors of the Mind. From the Heart Press, 2015, pp 112-118. 53. Armentrout, D.P., Rescripting and Other Delusional Thinking. The Journal of Regression Therapy, Vol. XIII No. 1, 1999, pp 84-88. 54. Lucas, W. B., Regression Therapy: A Handbook for Professionals. BookSolid Press, 1992, pp 119-125.